Walk through Loretta’s front door into an Instagrammer’s Narnia. With exposed concrete walls and floors, glass pendant lighting and oak-finished wood, Loretta exemplifies industrial chic. You’d be forgiven for mistaking it for Tumblr. We expected big things having been loyal fans of Loretta’s older sister, the Wellington institution that is Floriditas, for the past few years. Despite being the new kid on the block, Loretta has come out swinging. Its understated confidence makes it difficult to describe as anything other than perfect. With custom-made earthenware, daily seasonal menus and house-made sodas, every Loretta experience is unique. 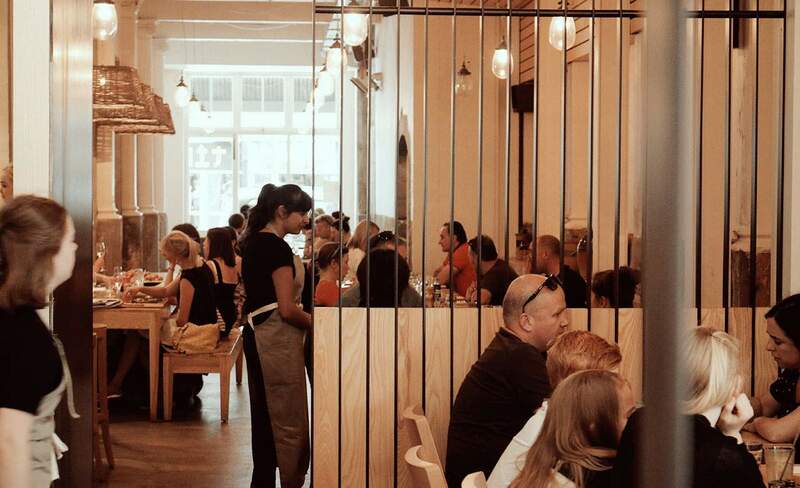 Loretta is yet another addition to the string of impressive new establishments making Cuba St a mealtime go-to. Loretta is casually cool; patrons are a diverse bunch united by the smug sense of being in the know about Wellington’s latest gem. We visited Loretta on their first open Sunday, and were impressed by the service and apple and feijoa cake ($6). Since then, it’s only improved. The staff are incredibly attentive; our water glasses were refilled before we even realised we were thirsty. The menus include a daily weather forecast. Despite a capacity to seat 100, the layout provides a fine balance between intimate and communal. Watching the chefs preparing our meal in the open kitchen, we were struck by the urban farmhouse feel. Loretta’s menu revolves around fresh, seasonal produce and concentrates on vegetables and grains. There’s not a lot in the way of meat available at lunch, unless you’re inclined to order a half ($22), or whole ($38), “chook”. These sound great to share with some sauteed agrias with lemon and thyme ($9) and beets with coriander and sherry vinegar ($8) - if you’ve got 30 minutes to spare for cooking time. The broken chicken sausage, fennel and dill woodfired pizza ($22) was a hit with us. You have to try the feijoa and lime house-made soda ($5), especially if you’re from up north and suffered intense feijoa withdrawals this season. Their coffee is sharp and exceeds even the Wellington standard. While Loretta, serves brunch, lunch and dinner, the brunch menu is a standout. We’ll be there for waffles with blueberry syrup, coconut yoghurt and bacon ($17) next on Sunday. Oh, and don’t forget your branded pencil on the way out; mints are so 2013.